In Japan, there are a lot of idols, and most idols give some concerts for their fans. When an idol announces the concert, their fans apply for tickets. After the fans apply, if there are more people than the capacity of the hall, there will be a lottery. After the lottery, the tickets is sent to the fans who are able to go. Tickets are different for each idol. On the ticket there is a lot of information. 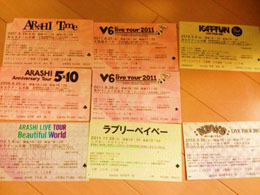 Most fans keep the ticket after the concert as a memory. Before the concert, some of the fans make a Japanese fan called an "Uchiwa". On the Uchiwa most fans put the idol's name or something that they want the idols to do. 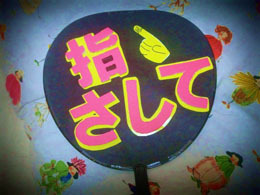 For example, on this Uchiwa it says, "PLEASE POINT AT ME". The idols might see it, and maybe they will do it! This is one of the places where concerts are held. The capacity and the area are so big. We can just see people, people, and more people. For one concert, a lot of staff are employed. The staff take us to our seats, sell items, and do all of the work to make the concert go smoothly. This is how I look during the concert. 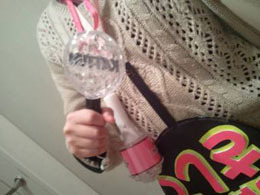 I hang uchiwa, light stick, and binoculars around my neck. We use binoculars to see the idols when they are standing farther away. This is what we can get at the concert. The first item is a poster. 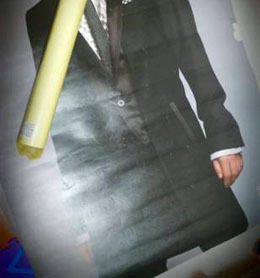 This poster is really big, and the idol looks very handsome. If we want this we have to buy it at a concert shop. 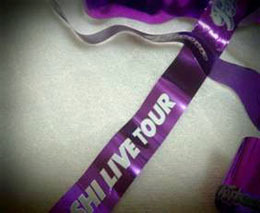 The second item is a tape or ribbon that was scattered during the concert. We cannot buy it anywhere, so this is a special thing for the fans. For the Japanese teenager, an idol's concert is a special event. The concert will become a lovely memory, and that memory will become our energy to live. A concert makes us so happy. It is an amazing and fantastic time! Child Research Net would like to thank the Doshisha International Junior/Senior High School, Moeko Yamamoto, student and author, for permitting reproduction of this article on the CRN web site.